Has anyone purchased the complete kit from RaceBrakes Sydney? Bump? I'm waiting for them to get back to me with a price. If it's heaps, I'll try Holden. Can anyone confirm if there is both an ABS and non-ABS VT master cylinder? 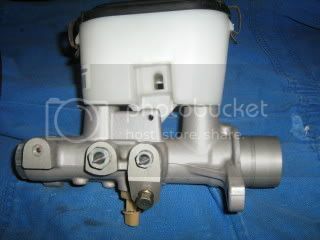 Booran Holden (Cheltenham) quoted me $177 + GST for the VT master cylinder (in stock; one listing only? 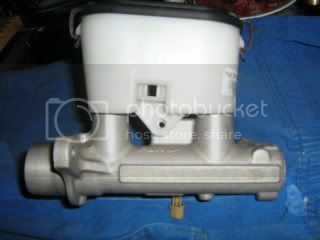 ), and $204 + GST for the VS V6 brake booster (not in stock). Hopper Stoppers wanted $36 for all three line adaptor fittings (BQ40A, a kit with all three; in stock). Ok, got a response from Race Brakes Sydney. The kit they do is for the VT master and VT metal booster (twin diaphram), not a VS V6 booster. I was quoted $690 delivered. So it all depends on what booster you want to use. Last edited by 5spdvl; 16-02-09 at 15:18.
i picked up the adaptors from hoppers stoppers, 36 bucks in stock all good. Yep, that's what I was quoted today. I really cbf driving all the way over to Hoppers, I think I'll get them to post them. I got a friend that lives in Hoppers, it's always such an effort to visit. Just a quickie bout the master. is VT non ABS master the same as the ABS one. VTs were only built with ABS. Therefore, there is no non-ABS VT master cylinder. Check with Holden if you don't believe me. I believe. I didnt think any came out without ABS. But we all kno ebays rep.
vx model came with abs across the range. the masters are the same however, just on non abs models, the bung/blank screw is removed so both ports can be used for front brakes. abs models have this bung screwed in and only uses two lines that feed into the abs unit. Holden spare parts - as useless as an ashtray on a motorbike. are you saying that the VX^ can be used by taking the bung/blank screw out? can it be that simple? Can i use the V8 Booster from VN-VR?? But have been told it can be done???? has anyone done this to a vn/vp commo, or know someone who has? so woah woah woah. too many people saying conflicting things here. i'm going to go by what you say simply because its your thread and the people who have followed what you have said to the letter have all come back saying wow great improvement etc. what is the vt MC you need? and howcome people are reporting the vt res doesnt fit? do i want the abs or the non abs vt mc? and with this you are saying the vs res will fit? thanks, just want to clear it up before i hit up some wreckers/start trying to organise fittings being posted across aus. get a vt master, mine was an abs model, i had to remove the bung for the second front brake line port on the master for the front brake lines on the vl, like i described earlier. the reason you use the vs resevoir is because you can fill it better because it suits the angle of the vl firewall. if you leave the standard vt resevoir you will find that the fluid can only be filled a certain amount because of the funny angle it sits on. you don't have to change it, but it gives a far better result if you do. the resevoir has a single bolt underneath that you undo and pull the plastic resevoir out of the grommets, easy. Would have end up doing the brake lines. And dont think id stop there. Anyway. 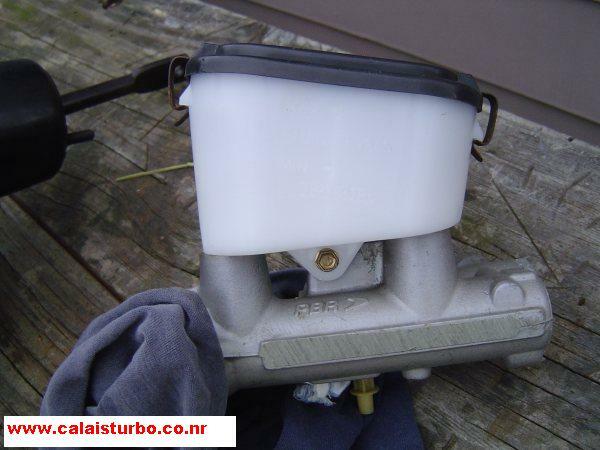 Recenlty bought a VX Master cylinder. The reservoir dont seem to have as much of an angle on it as the one pictured at the beginning of the thread??? Has anyone come across one like this???? Last edited by ILK; 01-04-09 at 19:51. I dont think i'll need the VS reservoir. Maybe the VY had a less angled reservoir???? Also my fittings from Hoppers Stoppers didnt come with copper washes..
Are they needed to seal???? Yes, get the copper washers. You need to check that the reservoir sits fairly flat when installed, so your brake fluid doesn't spill. Cheers i'll double check that. If i have no luck today at AUS hose, I guess i'll just have to get them send from Hopper Stoppers. Make sure you all ask for the copper washes if you are ordering them. I have a VK commodore rally car, the brakes have been upgrade to Vovle 4piston fronts, the rears have Volvo 2 pistpn calipers. The master cylinder is a new 1 inch bore. The problem I have is the pedal is very soft, moving approx 3-4 inch before pressure is applied to the brakes, making for a ‘long pedal’. Do you guys believe a VT master will remove the long pedal? Also is there a cylinder with the same valving as the VT cylinder with mounting the same as the original booster bolts holes? Or can i mount the VT master to the early model booster? As i just spent $300on a new booster with increased power and cant really afford another booster.